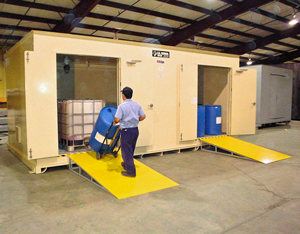 Safe corrosive storage lockers by US Chemical Storage for tote and drum storage applications. Corrosive chemicals are considered liquids or solids that can potentially cause harm or irreversible alterations to human skin tissue, after immediate contact. The EPA constitutes a highly corrosive waste as “aqueous waste exhibiting a pH of less than or equal to 2 or greater than or equal to 12.5 and capable of corroding steel at a rate greater than 1/4 inch per year”. Industrial processes that utilize corrosive substances include electroplating, battery manufacturing, chemical syntheses, metal cleaning, metal etching and electrolysis. The risk of exposing workers to corrosive materials should be clearly identified and evaluated prior to handling, transporting or storing such substances. Personal protective equipment should always be utilized when dealing with corrosives. The type of ventilation system necessary to minimize hazards associated with corrosive vapors depends on the type of corrosive substance being stored and the size and layout of the storage atmosphere. Safe corrosive storage lockers should be equipped with mechanical ventilation units. Mechanical ventilation eliminates hazardous vapors prior to personnel entering a corrosive storage locker. Safe corrosive storage lockers should also include a variety of safety accessories such as: fire suppression systems, proper warning labels exterior to the building and a sump containment for containing any spills or leaks. For more information on safe corrosive storage lockers visit us online or call 888-294-2729 for a free chemical storage consultation.